Well, there are times when you want to move your master database from the default location to some other drive. Now this activity cannot be done with the normal ALTER DATABASE statement with MODIFY FILE option. And you need a spacial handling for this case of master DB. –> Now leave SSMS, and open SSCM i.e. SQL Server Configuration Manager. 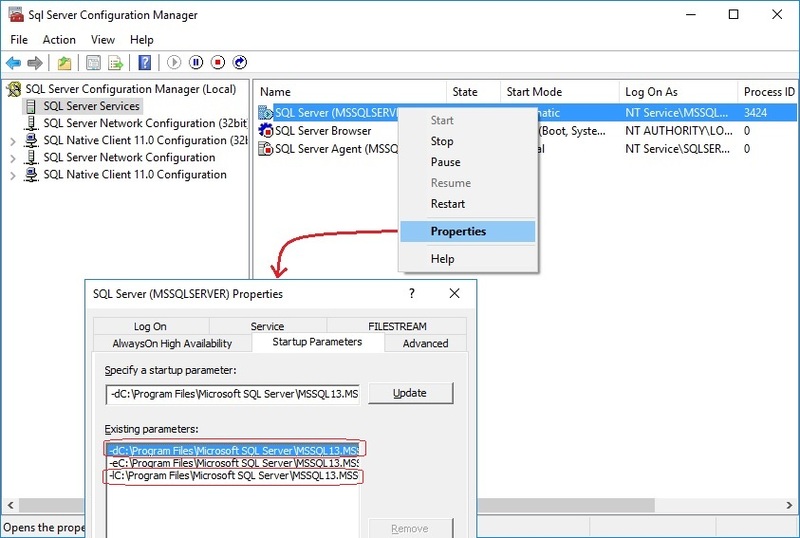 Here select “SQL Server Service”, and Rigth Click on the instance of SQL Server, and choose Properties. Now select the Startup Parameters tab. 1. -d is the path of the master data file. 2. -e is the path of the SQL error log file. 3. -l is the path of the master log file. SQL Server 2016 full and final version available – Download it now !!! Its 1st June 2016 and finally Microsoft has released SQL Server 2016 full and final version, and is available for download! Exactly a year back the first CTP version of SQL Server 2016 was released and we got a chance to get a glimpse of the new features coming in. Then after every month or two Microsoft kept rolling out the CTP versions with more new features, enhancements, and bug fixes on the previous CTP builds. To download SQL Server 2016 you can Register and Download the SQL Server 2016 Full or free Evaluation version (180 days) here. Microsoft on March 2016 announced that going forward the Developer version of SQL Server any release will be free for Developers and Learning purpose. Register and Download the Developer version.